Prvi Partizan, founded in 1928, is located in southwest Serbia in Uzice. Prvi also makes some of the best and most economically priced hunting and sporting ammunition on the market today. Recently, many shooters have discovered the fun in shooting the older, military surplus rifles such as the Mosin Nagant. 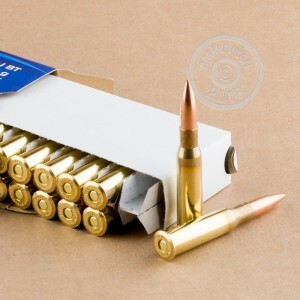 While surplus ammo is plentiful, it can be challenging to find modern, non-corrosive, reloadable ammo. Prvi Partizan has you covered with their 7.62x54R FMJ-BT ammunition. Fully reloadable, boxer primed, and using non-corrosive propellant, the Prvi Partizan 7.62x54R is loaded with a lead core, non-magnetic bullet. 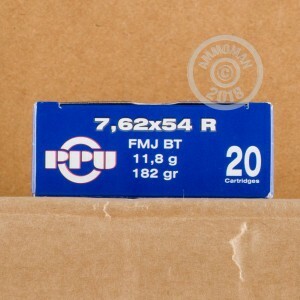 So if your range bans magnetic bullets or if you just want to stick with better quality non-corrosive ammo that will help you preserve the bore of your old ‘war horse’ and make cleaning a breeze, give the Prvi Partizan 7.62x54R FMJ-BT a try. Remember, at AmmoMan.com any single order totaling over $99 gets shipped to you FREE, so stock up and save! PPU is great, brass case, No misfires. point of impact is off to the right, not sure if ammo or bayonet not being on even though i'm leaning towards bayonet needing to be attached.